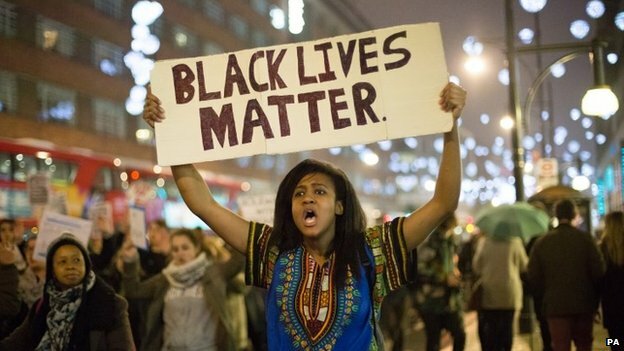 Can more precise criminal law show #BlackLivesMatter? Or is the problem fundamentally about power? I was left pondering this after reading Jack Halpern’s excellent follow up on the Ferguson, Missouri shooting of black teenager Michael Brown by police officer Darren Wilson. Let me take this out of a realm I know nothing about (criminal justice) and into a realm I know something about (political theory, esp. international relations). But Halpern points us towards some aspects of the Ferguson story that are not only/ primarily about structural power. Could a simple legal fix address much of the problem with racist policing? Perhaps by being more specific about what behaviors are acceptable, we could reduce policing discretion (and along with it the importance of cops’ biases and ideologies). If pocketed hands in winter are unacceptable, both police and civilians can know and plan their activities accordingly. If not, leave well enough alone.This could be called a black letter law strategy – essentially, getting to the point where the law is so clear it is no longer seriously contested. That’s not to say that a legal fix would be simple. Criminal law is complex, and a great many changes might need to be enacted to come close to achieving more precision. As the treaty literature teaches us, precision clears things up and can make actors take obligations more seriously, but there are limits to the practicality and desirability of total precision. Some scholars would say that imprecision is not an exceptional state of affairs – but the very means by which another kind of power operates: productive power. This “face of power” comes from the writing of French philosopher Michel Foucault. Alan Hunt and Gary Wickham provide a readable intro: with modernity, states take on broad governance functions that – to be effective – require ever greater plunges into regulating and controlling peoples’ bodies. This control is never fully effective, and indeed gaps in law are what invite further state plunging in. It’s difficult to find some sort of programmatic reform to counter this type of productive power, or even an empirical strategy to prove its existence. As Hunt and Wickham point out, Foucault’s writings suggest little more than contesting productive power through speeches and writings. If your social media feed has left you confused about which power to fight, Adolph Reed has a piece in this month’s Jacobin (not yet linkable) that is great but won’t make that choice any easier. He argues that we can’t hashtag our way out of racism, and that agency politics need to be paired with both structure politics and legal strategy. His article launches off from a critique of the movie Django Unchained, and takes us through Civil War structural politics as captured in the films Lincoln and Glory. He doesn’t settle the debate, but does point a way beyond unproductive either/or thinking.